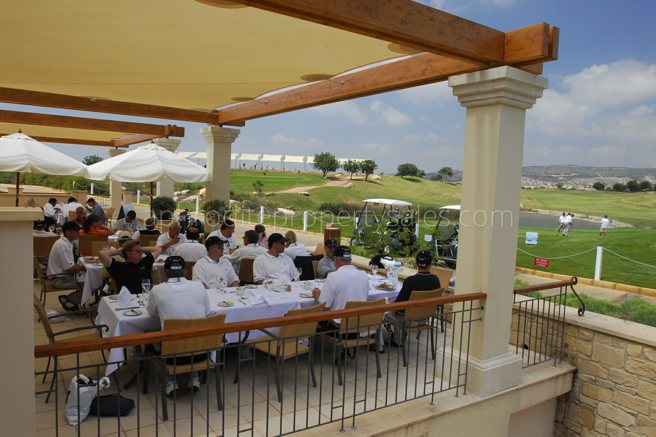 Aphrodite Hills is a fully integrated golf and leisure resort, the first for the Island of Cyprus. 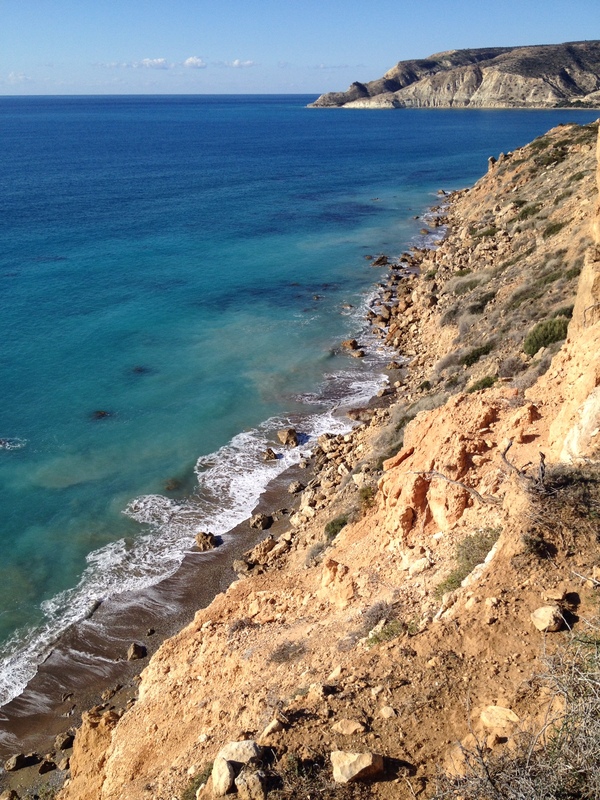 It is located in an idyllic situation on the coast just a ten minute drive from Paphos International Airport, twenty minutes from Paphos Town Centre and half an hour from the bustling marina in the port of Limassol. The Aphrodite Hills Resort straddles two magnificently positioned plateaux in a protected area of natural beauty, overlooking the clear blue waters of the Mediterranean Sea. The Resort has 24/7 security and medical services and consists of an 18 hole championship golf course with a practice putting green, golf range, 3 hole academy, an award winning spa, tennis academy, a luxury hotel, bars, restaurants and shops and even a huge kids play park and riding stables. With most of Aphrodite Hills’ properties having sea or golf course views from sun drenched balconies, it is a haven for holiday makers and golfers alike. The Resort is made up of over 850 dwellings ranging from delightful one bedroom apartments with spacious terraces, to large secluded villas with sumptuous gardens and private swimming pools. The apartments, semi-detached villas and some detached villas are arranged in villages with each village having at least one swimming pool and areas of communal garden. Most of the detached luxury golf villas are located on the Eastern plateau. They vary in size but all have spacious plots, the smallest being no less than 1300m2. The original vision of the resort designers was to make a beautiful green oasis in the midst of Cyprus’ natural landscape. They have certainly achieved this and the result is spectacular. 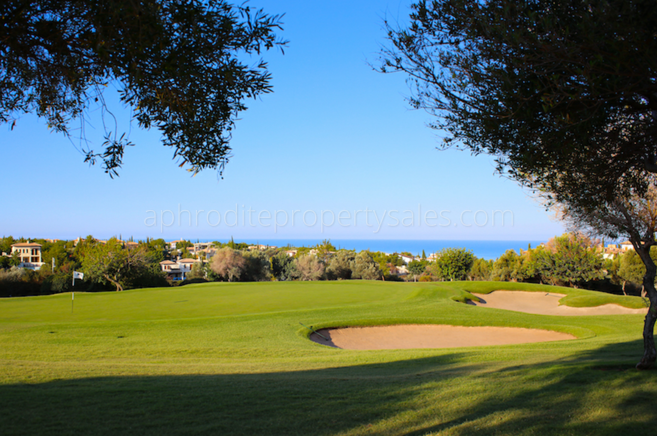 Aphrodite Hills has a small but completely self-sufficient community. 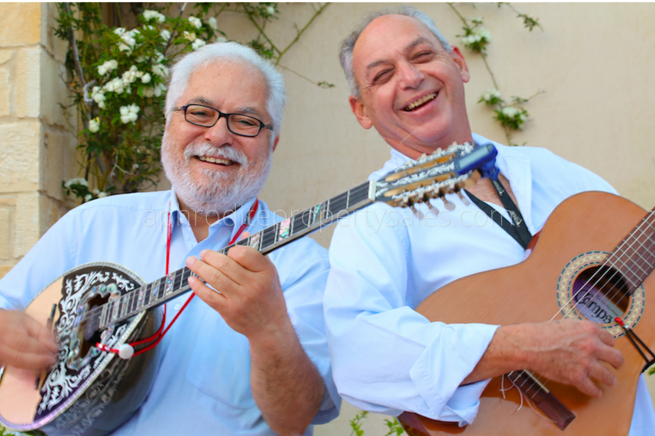 The Village Square comes alive at night under the twinkling lights which have been strung through the trees and, where on some nights there are local musicians strumming their guitars and singing traditional Greek and Cypriot songs. As well as bars, restaurants and a supermarket, there is a doctors surgery linked to a 24 hour emergency clinic in Paphos, a car and bike hire office and assorted play activities. Pithari Taverna. 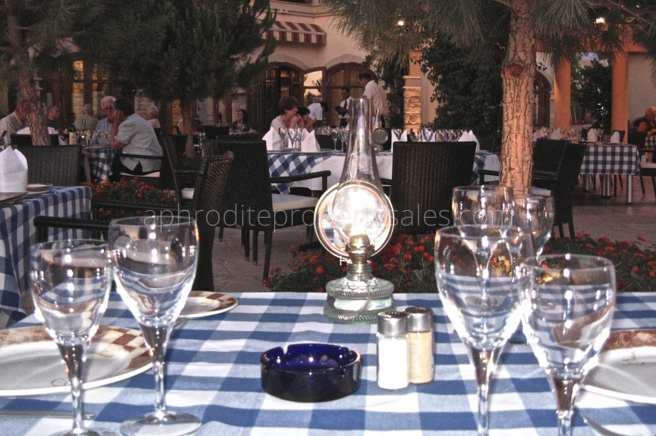 This is a traditional taverna style restaurant, with its blue gingham tablecloths. The restaurant has an excellent choice of local Greek and Cypriot dishes, including favourites such as mousaka and kleftico. The dishes can be served in meze style or ordered individually. The restaurant is open most of the year with balmy summer nights under the stars and a cozy indoor restaurant for the short winter months. Zimi Trattoria. 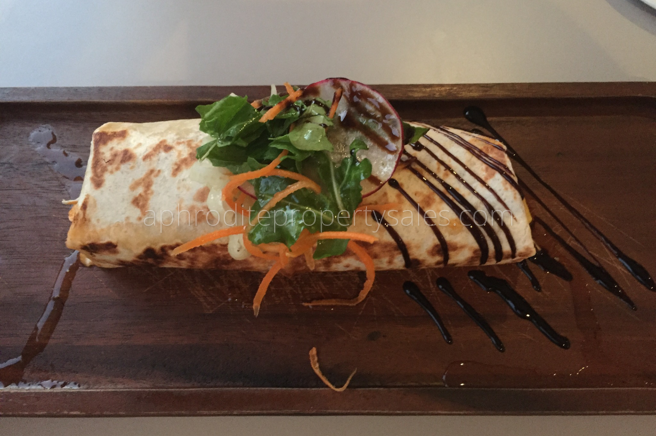 The Zimi is a firm favourite and is always busy, serving mouth watering Italian food with a twist. Perfect for families, the tables are either set in a covered pergola with glorious sunset views or in the square underneath the pine trees. The food served is predominantly Italian with some fabulous salads, pizzas, traditional pasta dishes and of course the odd glass of icy cold Prosecco. What better way to while away a warm summer night? The Anoi Pub is loosely based on an English style sports bar with typical pub food including the ever-popular burgers, fish and chips and sausage and mash. Situated up in the trees on the first floor, the Pub has a large indoor seating area and a wide wrap-around terrace with tables for guests who want to enjoy the balmy Cyprus air. The TVs are always on, showing the up to the minute matches and on special cup final days it can be standing room only. As well as the sports events the Pub hosts quiz nights and other family entertainment. The Pub is usually open from mid afternoon until midnight, seven days a week. Gate to India Recently opened on the Resort is Gate to India, a beautifully presented, modern take on traditional flavours from around the Indian Regions. The stylish restaurant is located in the heart of the village square, adjacent to the Pithari Restaurant. The mouth watering flavours and warm and courteous staff make a meal here a very enjoyable experience. The Golf Clubhouse is available for golfers and guests alike. Food is served all day from breakfast onwards, Sunday lunch is a speciality and bookings are recommended. The terrace has a wonderful view of the eighteenth and armchair golfers take great pleasure in watching the unwary negotiate the final water obstacle to get to the green. The clubhouse is also a wonderful venue for sumptuous weddings, private parties, golf dinners and prize givings. The award winning Retreat Spa at Aphrodite Hills is the perfect antidote to hours spent on the golf course. The spa offers its guests beauty treatments, sports massages, facials, hairdressing and a wide variety of other pampering experiences by a team of expert therapists to make your visit truly memorable. There is also a gift shop, gym, restaurant serving health salads and juices and delightful pool area with infinity edge swimming pool with views straight out to the Mediterranean Sea. The spa is built in enclosed grounds with access to a fabulous Secret Garden with fountains and aromatic planting, another romantic venue for smaller weddings and private parties. Aphrodite Hills Tennis Academy has nine floodlit courts and is busy all year round with coaching and tuition, social tennis and events and tournaments. There is a resident tennis professional, a well stocked shop selling a range of clothing and equipment and a bar to relax and enjoy a reviving drink after a strenuous work out. 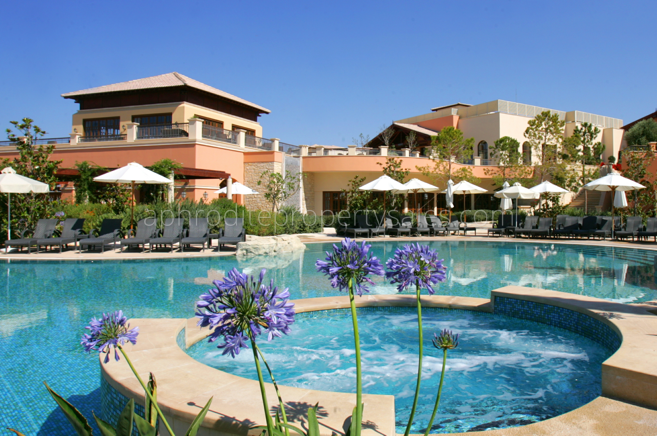 There is always something wonderful to experience at Aphrodite Hills Resort.